Peter Young's photo was taken on the 7th April 1973, a study in verticals: the 1877 fountain; the 1867 campanile-style standpipe tower of the Grand Junction Water Works; the gas holder - 1960s? ; and the block of flats -1960s?. Street furniture, the ornamental cast iron lamps surrounding the fountain and the squat black and white striped bollard all point upwards. The photo was taken from near Kew Bridge looking westwards towards the High Street. Standing on the same spot today the standpipe tower and flats remain. 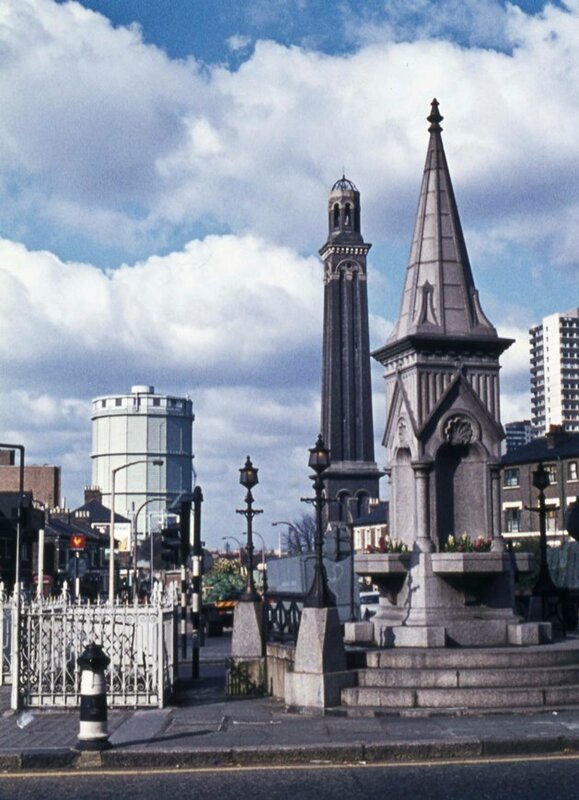 The fountain, originally the focus for market trading in late Victorian times, became too much of an obstruction and was moved to the Western International Market in 1974: Janet McNamara's history of the market includes a photo of the fountain at its new site. Brentford Fountain Leisure Centre, built in the 1980s on Chiswick High Road, was named after the fountain. The gas holder was one of two which survived the transition to natural gas in 1963; both were demolished in 1988 (Brentford Past). The site has an atmospheric 1950s gas holder view and also a view of the same from the west, around 1970.